Whether luxe living is your general vibe or something you take in small doses, there’s plenty of it to go around in Seattle. Our biggest food attractions are no secret these days -- Edouardo Jordan, of critically acclaimed Junebaby and Salare, made sure of that in 2018, with all his big culinary wins and New York Times seal of approval. But knowing about these high-end spots is one thing, being able to secure a reservation is a whole ‘nother. 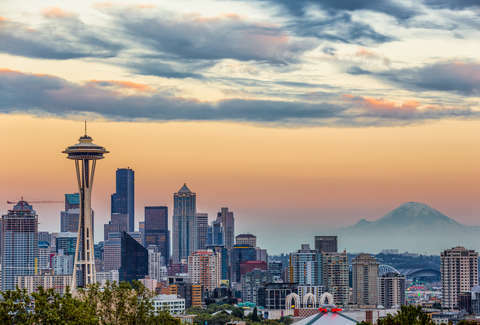 To guarantee you can actually enjoy the finest the Emerald City has to offer, it’s time to uncover some different must-visit locales -- and a quick look at your best options leads to just outside city lines. Where to start? Don’t worry fancy pants, we got you. 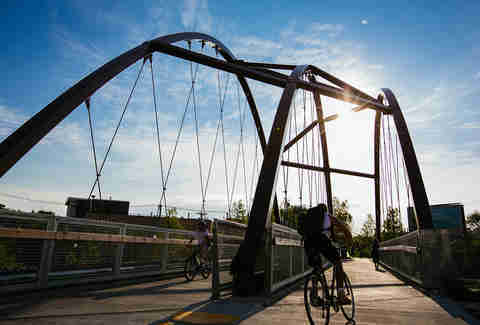 Here are the best venues and activities, all within an easy drive of downtown, to hit when you’re ready to ditch the crowds but still pop that pinkie. Salt and Iron is a rustic and natural light-drenched oyster and steakhouse located just up the way from the waterfront in downtown Edmonds. 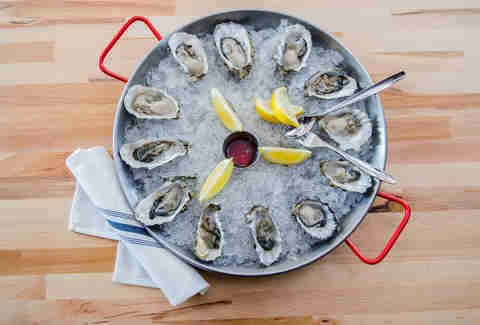 Order a comically large plate of oysters -- you can get them fried if you’re feeling extra indulgent. Best time to do this? The spot features a "progressive" happy hour Monday through Thursday -- pop in at 3pm for the best deal on Pacific oysters at just a dollar a pop, so you can eat like a rich person but pay like a frugal one. Hop aboard a hot air balloon and enjoy fresh croissants while taking in stellar PNW views. You have the option to set off at either sunrise or sunset with Seattle Ballooning and indulge in strawberries while taking in stunning views of Mount Rainier, the Puget Sound, the city skyline, and beyond. Full speed ahead! Granted, that isn’t much speed, but that’s okay, you’re here for the glam. Did you know that deep in Lynnwood burbles a spring affectionately named Well No. 5? The well's artesian agua is sourced from an underground aquifer about 200 feet down. 164th Street Artesian Well’s H 2 the izz-O is the crispest and cleanest you’ll find around, so nab yourself a gallon or two and you can always feel fancy while hydrating with some of the finest artesian water around. What’s classier than a Steinway piano? Pretty much nothing. That’s why you should catch some live jazz at the Royal Room. Located in a happening corner of south Seattle, it’s the perfect introduction to a night out in Columbia City. At this atmospheric spot you can kick back at a table, order a couple plates, and enjoy a live show all without the mad crowds and lines you might encounter at other Seattle music venues. You don’t have to spend a lot to enjoy luxury. With car2go, you can navigate the city in style behind the wheel of a Mercedes-Benz for less than you’d think. Get straight from point A to B in style, and savor how premium driving feels without the premium price. 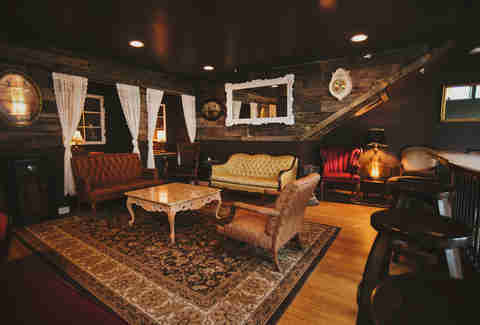 ...Or at least in the greater Seattle area, at Lady Yum or while strolling the beautiful Kirkland waterfront. Macaron flavors at Lady Yum include raspberry chardonnay, honey lavender, and espresso fudge, to give you an idea of the kind of class you’re dealing with here. The Parisian confections at the French-y cafe come in every color of the rainbow and are the most ’gram-able dessert in town. The phrase “Je voudrais one of each” should set you on the right track here. The Nordic Museum just opened up in Ballard in early May and is a chic examination of Nordic culture in Seattle. Current exhibits include a biographical narrative of Norwegian explorer Fridtjof Nansen and a selection of works from contemporary artists hailing from Iceland, Norway, Finland, and elsewhere. After you explore, rest at Freya Cafe, which serves smørrebrød, personal smørgåsbord, pepperkakor, toscakaka, and more. Don’t know what any of that is? Order all of it to find out. The Nook is a relatively new addition to West Seattle, but already feels like a neighborhood pillar. Resplendent with tufted velvet couches and moody decor, the cozy two-story spot is the perfect place to kick back with a book and artisanal espresso. Collapse into the plush chesterfield couches with an oat milk latte, unplug, and chill the old-fashioned way. The bar also offers a fanciful snack tray that rotates with the season, if you get peckish. If you’re willing to spend a little more time in the car, you can channel your inner Kevin Costner (or Princess Mononoke) on a casual hang with some of nature’s most majestic creatures at Predators of the Heart, a 10-acre wildlife sanctuary located in Anacortes. An hour and a half north of Seattle, a visit here is well worth the drive up, and includes a scenic hike as you walk the wolves on leashes, hear a lesson on the history of wolves in the region, and best of all, enjoy some paws-on time with the pack -- one of the largest in the PNW. The wolves are extremely friendly, and enjoy howling with you, so don’t be afraid to get wild.